Perhaps it’s the gloom of recession, the spectre of unemployment and an economy in free-fall, but comedy seems centre stage right now in London. Later this month, Oliver Goldsmith’s warm and generous-hearted, eighteenth century rom-com She Stoops to Conquer comes to the National Theatre. And in recent weeks I seem to have seen rather lot of comedy, including Noises Off, One Man, Two Guvnors and A Comedy of Errors. Noises Off is, of course, one of the funniest plays ever written. Having premiered in 1982, over the years the play has grown and been through numerous re-writes. I managed to catch the 2000 National Theatre production which transferred to the West End, and remember laughing so much in the first half that by the time it came to the second, I could laugh no more – an interesting lesson in comic pacing for any aspiring actor or director. With a play so apparently set in the early 80s, the question must be asked, however, whether the play has stood the test of time. Without reinvention, many comedies don’t. Dad’s Army and The Good Life apart, many television comedies simply seem dated, five years later, let alone thirty – humour is generational and tastes change rapidly. Even the genre of farce, so brilliantly parodied in Nothing On, the play allegedly being performed by the cast of Noises Off, needed some explanation. The fact that it was a parody was not totally picked up. Nor, I fear, did all fully appreciate the dismal circumstances in which the desperate actors fond themselves: earning a pittance, travelling from one crap town to another, peddling a play of dubious artistic integrity. Nonetheless, the bulk of the play required not the slightest whiff of explanation – not least the brilliant slapstick movement of the second act, and, by the third act, the sheer ludicrous nature of the performance climaxed. It was a hugely successful piece of ensemble acting, in which a really well rehearsed cast got the timing just right – whilst retaining the semblance of chaos, this was highly choreographed and impeccably timed. And the audience reaction was ecstatic. Noises Off quite literally brought the house down. There is no hyperbole in any of the more enthusiastic reviews. Like any great comedy, you left feeling just that bit better about the world – no real villains, no nasty ogres, just silly people doing silly things. 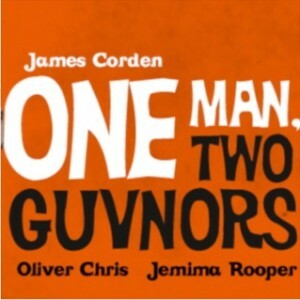 Remarkably similar in its form of comedy was the farcical One Man, Two Guvnors. I managed to see the National Theatre’s original cast version on its West End transfer. Corden seemed to be the draw for a good chunk of the audience, and at his first appearance (heralded by wolf whistling from somewhere in the stalls) only one reaction could be had by any sane individual with a sense of taste, decorum and decency: get me out of this cesspit. I first, unknowingly, saw Corden in The History Boys at the National in 2004, and even then he was one the more memorable of the students. But whilst I am a big fan of Gavin and Stacey, sometimes it’s struck me that he’s become something of a tired brand with an almost predictable style of comedy, much of it focussing on his size or simple crudity. Actually, the slimmed down Corden was remarkably funny. In fact, he was extremely funny. His performance, as Francis Henshall, the ever hungry Truffaldino type character , moved right away from being a caricature of himself. There were moments when Frank Spencer might even be the best comparison to describe the character he created. Whilst much of the performance stuck solidly to the published script, Corden’s apparently impromptu soliloquies involved some great one liners and I particularly enjoyed the self-effacing references to his (poor) hosting of the Brit Awards the previous evening. There was a tremendous sense of fun: the stage band, on stage a good fifteen minutes before the play began, took the audience straight back to a London of small time gangsters and a saucy post card Brighton of 1963, both through their skilful playing and their immaculately observed appearance. And the cast as a whole were of almost equal strength. I particularly enjoyed the character played by Tom Edden of a very decrepit, shaking waiter whose moment of glory was undoubtedly a hotel scene in which Henshall attempts to serve his two masters and keep them apart – with hilarious results. With moments of farce and slapstick, the humour rarely dipped. Audience participation (and clearly ‘staged’ audience participation) only increased this though without any cringe factor! For students of theatre there was much to take in, even if ironically – the opening set featured two doors, a nod to the great traditions of farce. Quite what New Yorkers will make of it all when the production transfers to Broadway is anyone’s guess. Much of the humour was distinctively English as opposed to even being British, although some characters such as the posh nincompoop played by Oliver Chris will go down well, whose lines about public school life made some of the audience near me come close to retching with laughter. Nonetheless, I’m glad to learn that the new cast, headed by Owain Arthur, have been warmly received. Yes, it’s still worth a hit on the credit card! Step back a few years, and Lenny Henry is a strong contender for being the Corden of his day: we just couldn’t get enough of him. Over the years, he has gradually moved from Saturday morning children’s television to sketch shows and sit com. A versatile performer, to widespread praise he’s tried to reinvent himself as a serious actor, and he assumed the title role in Northern Broadsides‘ production of Othello. 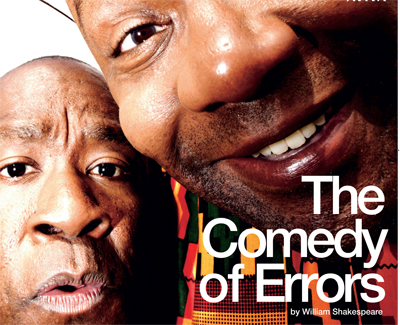 In A Comedy of Errors at the National Theatre, directed by Dominic Cooke, one would have expected him to have been even stronger, such is the room for clowning and slapstick. Confusion between twins, double crossing, farce, echoes of Commedia – a play such as this should have been uproariously hilarious, in what is one of Shakespaeare’s more light hearted, early comedies. Perhaps seeing a matinee at the end of the run was part of the problem, but I was moderately underwhelmed. A dark, dramatic opening, complete with helicopter winching, took a long time to dispel and I found it difficult to get into the rhythm and world of the play: it was the second half before I even vaguely chortled. Henry did his characteristic funny faces, but the real stars were the comic duo of Dromio and Dromio, played by Lucian Msamati and Daniel Poyser. Some well choreographed set pieces should have hit the mark – but just fell short. The denouement, however, was nicely handled, and the darkness of Act 1 gave way to a sense of restoration. For pretentious English types (i.e. me), there was much intellectually to debate, especially the overlaps with Measure for Measure, some of which I have never quite realised. But as entertainment, for me personally, it did not quite work – though most of the audience seemed to leave jovially if not ecstatically, and the group of students behind me loved every minute. Both Noises Off and One Man are now playing in the West End. If I were forced to chose between them, and if my life were to depend on it (and only then), One Man, Two Guvnors narrowly beats Noises Off, both in terms of innovation and, perhaps even more importantly, laughs-per-minute. But the best line in all the plays unquestionably went to the character of Lloyd Dallas, the artistically frustrated director in Noises Off: ‘I’m just the one with the English degree – what do I know?’ Amen.